Hayward Turnstiles Adapta Rail Stainless Steel Post and Rail system was created to give our customers an all in one solution for their crowd control needs. Our stainless steel Post and Rail fit seamlessly with our Turnstiles and ADA Security Gates or as a stand-alone system. Hayward’s Post and Rail system can be used as crowd control for patron queuing and as patron directional guides or channel pedestrians through turnstiles. The stainless steel construction allows for outdoor or indoor use in a wide range of applications from theme parks to executive office areas. 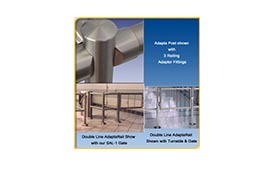 At Wipaq Dubai, UAE; we provide free quote estimates for Stainless Steel Crowd Control Rails. Call us for Stainless Steel Crowd Control Rails Saudi Arabia | Bahrain | Dubai | Oman | Egypt | Kuwait | Turkey | South Africa.